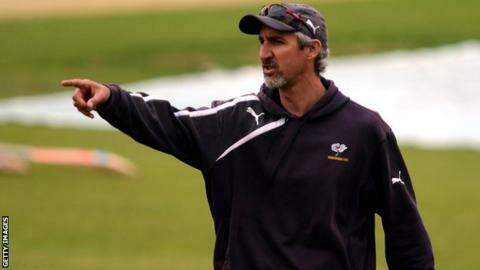 Jason Gillespie says Yorkshire were driven to win the County Championship this season by captain Andrew Gale's ban from lifting the trophy in 2014. Gale was suspended last season after being found guilty of abusing Lancashire batsman Ashwell Prince. Yorkshire secured the title this week on day one of their game at Middlesex. "When we were told that he wasn't able to go out and lift that trophy, my blood boiled," head coach Gillespie told BBC Radio 5 live sports extra. "I know it's been something that's driven Andrew, it's driven our whole squad, and it's certainly driven me as a member of the support staff. "I can't tell you how satisfying it's going to be when Andrew rightfully gets to lift that trophy at the conclusion of this game." Former Australia paceman Gillespie, who was heavily linked with the England coaching job earlier this season, said he was pleased with his team's willingness to back up their ambition with actions this summer. "The most pleasing thing for me is that the lads all said last year that they wanted to do it again and that is easy to say," he added. "What we saw is that their actions backed up those words. They wanted to win it again and that's the goal, but what they did was find the way to do it. "It started with pre-season and the work ethic in the north of England in the middle of winter. They had the motivation to do their drills out there in the cold." He added: "It's hard to say if this is a better achievement. Both are special in their way. "We've gone about things differently and it's great to have the success."